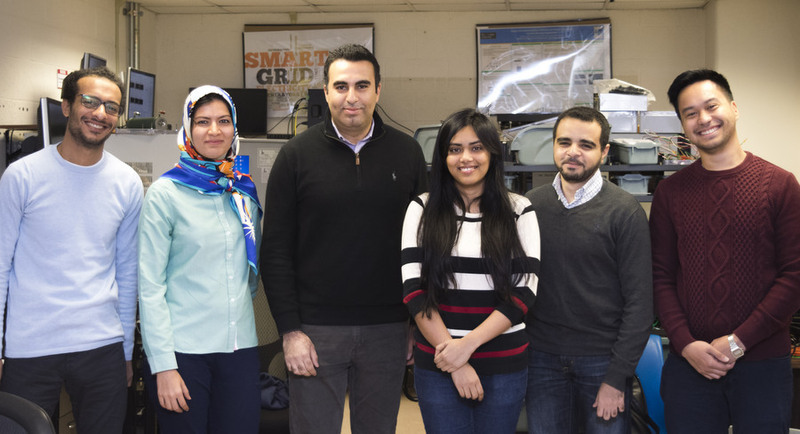 Electrical engineer Ahmed Mohamed [center] and PhD student members of his CCNY research team [from left]: Tamer Ibrahim, Mahdiyeh Khodaparastan, Oindrilla Dutta, Mahmoud Saleh and Jason Baldorado [graduate student]. As he continues research that could make the rail transit system more energy efficient, City College of New York electrical engineer Ahmed Mohamed is the recipient of $320,000 in funding from the New York State Energy Research and Development Authority to advance his pioneering work. It is over two years. The funding brings to more than half a million dollars the support Mohamed, an assistant professor in CCNY’s Grove School of Engineering, has received for the project since last year. He was awarded $210,000 by ConEd in 2017. Mohamed’s quest is to develop technology that can capture the regenerative braking energy released by trains whenever they brake. The idea is to harness this energy and either store it or redirect it to the energy grid, said Mohamed. One benefit of recapturing regenerative energy would be to allow trains to move to the nearest station in case of an outage. A reduction in energy consumption and greenhouse gas emissions in line with New York State requirements. Research participants include students from the department of electrical engineering in the Grove School, which is celebrating its centennial. Mohamed is founding director of the Smart Grid Laboratory. He is also affiliated with other CCNY-based CUNY Research Centers.